Having been born and raised in South Texas and fishing since the age of 3 (1965) with my father along the Texas Gulf Coast…fishing has been a huge part of my life. Growing up in the small coastal town of Rockport, Texas enabled me to get out on the water every spare moment of my life. I met (and later married) Capt. Dave Noling in 1992, quit my job as a flight attendant and began traveling the globe with him as crew of different boats he’s run over the many years we’ve been together. We lived in St. Thomas a few years, fishing mostly there, Mexico and Venezuela and experienced some of the best fishing the world has to offer. Venezuela then became home for us for several years, where Dave was able to set a record catch of over 1000 blue marlin in a short 4-year period, along with thousands of sailfish and white marlin too. I was lucky enough to be on board as crew/angler for some spectacular fishing and have the opportunity to learn from some of the best in the industry for many years. We then added more Pacific locations to our travels over the years, which enabled me to fish more and compete in many tournaments and win several awards, including the World Billfish Series Championship in 2005 in Costa Rica and be the only woman [to date] to ever do it. 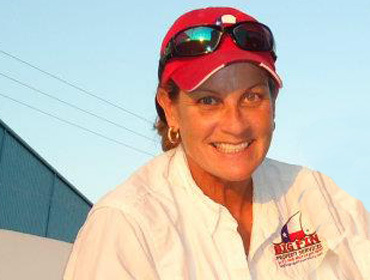 I’m now the Tournament Director for The John Uhr Memorial Billfish (aka Bastante) Tournament that I created in honor of my dear friend (also dear to many in the sportfishing industry) that died of cancer in 2010. The event takes place every summer in our home town of Rockport, Texas and became the new home of the Texas State Record (972.7 lb) Blue Marlin in 2014.